Data is valuable to every organisation, and because of the amount of information that companies generate regularly, there is a need to have an organised system, to maintain and secure such data. A company’s images, emails, data and other sensitive information, usually consume a lot of disk space, and therefore, it is necessary to manage these sensitive data areas. Companies are beginning to embrace a system where they have to back up these files to protect them. Billions of dollars are spent every year by organisations, to protect their data against viruses, as they are now aware of how vulnerable their data is if it is not managed correctly. The type of storage equipment being developed is continually changing, to meet up with co-operating needs, especially where corporate entities send information to other partners around the world. Data management specialists usually encourage corporate bodies to adopt more than one storage method, when choosing to protect sensitive data. Here are some of the types of storage available to safeguard an organisation’s data. Thumb drives are usually referred to as flash drives, and they are one way to protect valuable information. However, this device can only accommodate limited storage capacity and consumes very little power. The flash drive is usually pocket-sized and can be carried around easily. The problem with this storage system is that it can easily get lost, or damaged, because of its size. The hard drive is another storage option, especially for small and medium enterprises. They usually come with a larger capacity than the flash drive. They are very affordable, and portable to carry around. The external hard drive should be kept in a suitcase when packed away. The data in the external hard drive should be backed up on other devices because it can easily get corrupted. Also, because of its size, this device can get stolen or lost. Network-attached storage (NAS) is a backup system that allows users to store a large amount of data using a hard drive attached to an Ethernet port. NAS sometimes uses a Wi-Fi connection and can be connected to more than one hard drive in a Redundant Array of Independent Disks (RAID) array. NAS helps to improve the network servers and reduces the load on other servers while storing data. It is a recommended solution for small and medium scale organisations. This is one of the best systems of storing sensitive data. It is an attractive option for both small and large businesses. Files and information are very secure using online platforms. Storing data online, or on remote servers, allows the company to share data with other partners, located in other countries. Data can easily be accessed using a web browser, and there is no need to travel with any external drives. 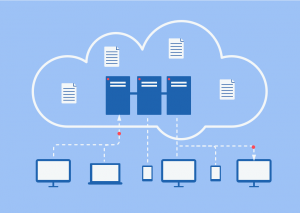 The challenge with this storage system is that when uploading files for backup on the cloud, it can take a lot of time because organisations will be limited to their own internet upload speed. Companies can choose to pick any of the mentioned data storage methods listed in this article, but to guarantee that your data is adequately backed up, it is advisable to choose as many options for the storage needs of your business. Companies perform better when they have a proper storage system.